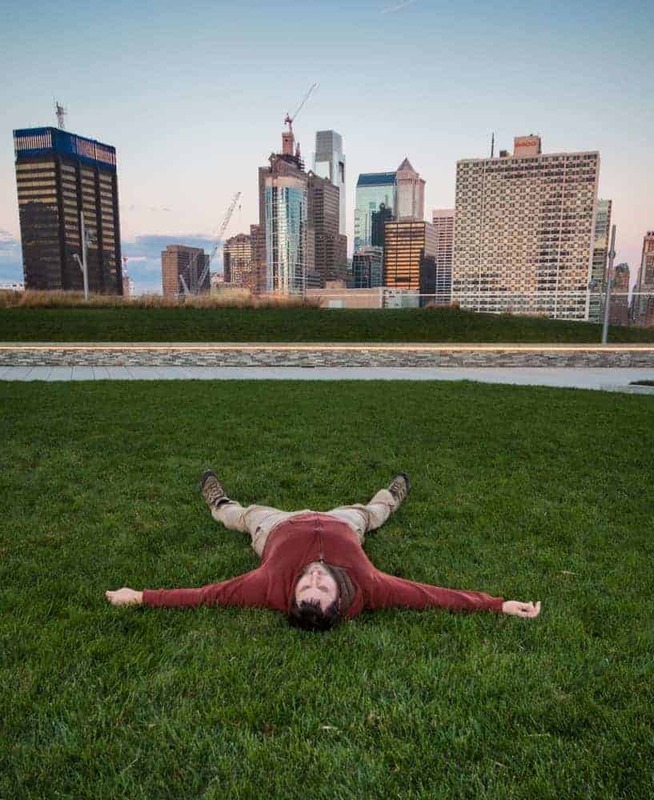 There are many great parks in Philadelphia, but none are quite like Cira Green. That’s because Cira Green is a park built on the roof of a 12-story parking garage. Despite being located 100 feet above the ground on top of a concrete structure, Cira Green feels very much like a park. There are walkways, benches, and even several sections of grass that are perfect for relaxing. 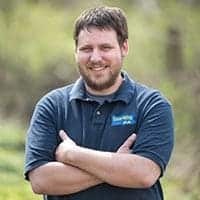 While Cira Green is only a little over an acre in size, it’s well worth taking the time to see if you are looking for one of the best outdoor spots in Philadelphia. 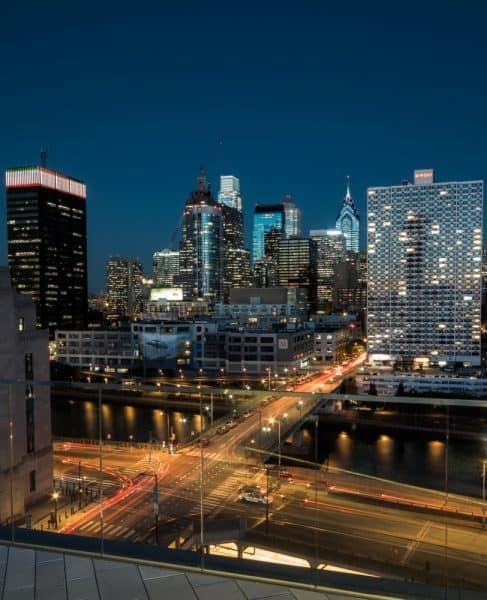 Nighttime views from Cira Green are quite stunning. Cira Green is located between two skyscrapers over 30 stories tall in the University City neighborhood. 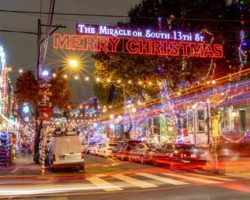 The main entrance is located along South 30th Street, just a few blocks south of the Philly’s Amtrak Station. From the main entrance, an elevator takes you up to the 11th floor. 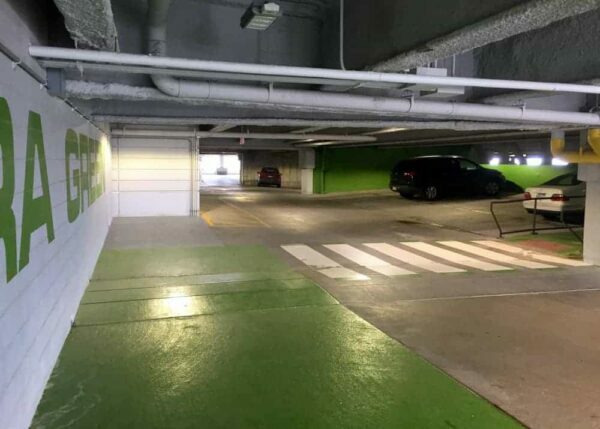 From here, follow the green path up the nearby ramp to the top of the garage. The first thing that will strike you will undoubtably be the view of Philadelphia’s skyline. Philly’s skyline from Cira Green. 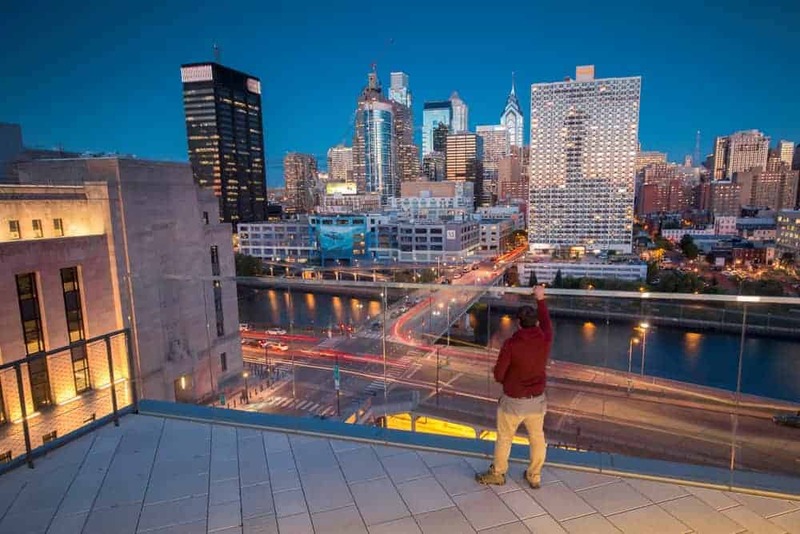 Looking east, Cira Green offers an unobstructed view of the Philadelphia Skyline thanks to the train track, highway, and Schuylkill River below that prevent any tall buildings from being built nearby. 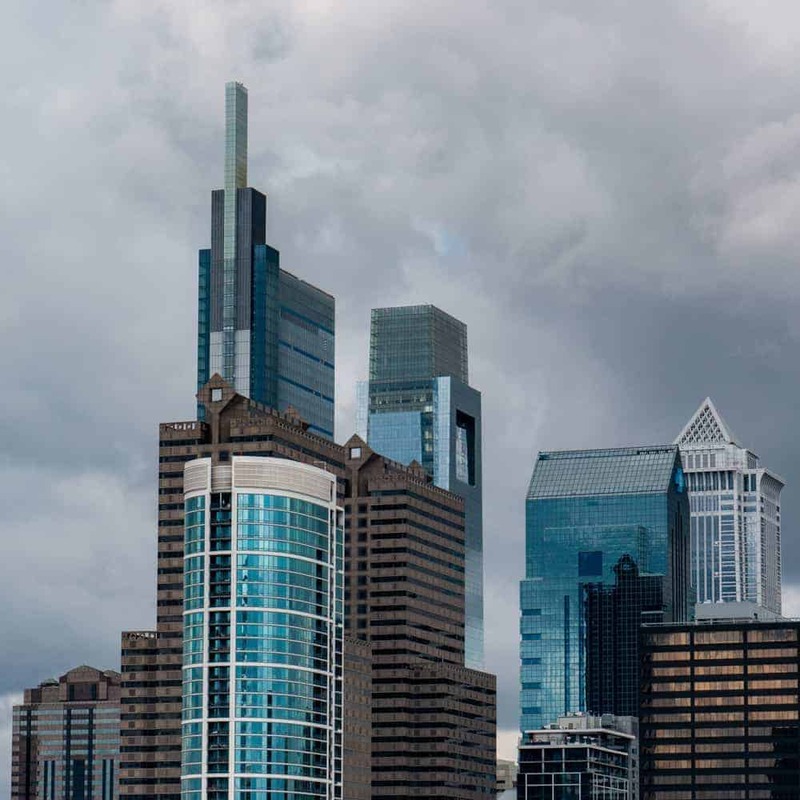 Without a doubt, this is one of my favorite spots for great photos of Philly’s skyline. There are also views to the west. While the lack of tall buildings gives you a vast view of west Philadelphia from here, it’s a bit lacking from a photography perspective. Looking out over Cira Green. Personally, I love to get carry-out from a nearby restaurant and take it up for a picnic at Cira Green before a bit of early evening photography. The grassy areas make this a perfect spot to relax for a bit and simply watch the bustle of the city far below. 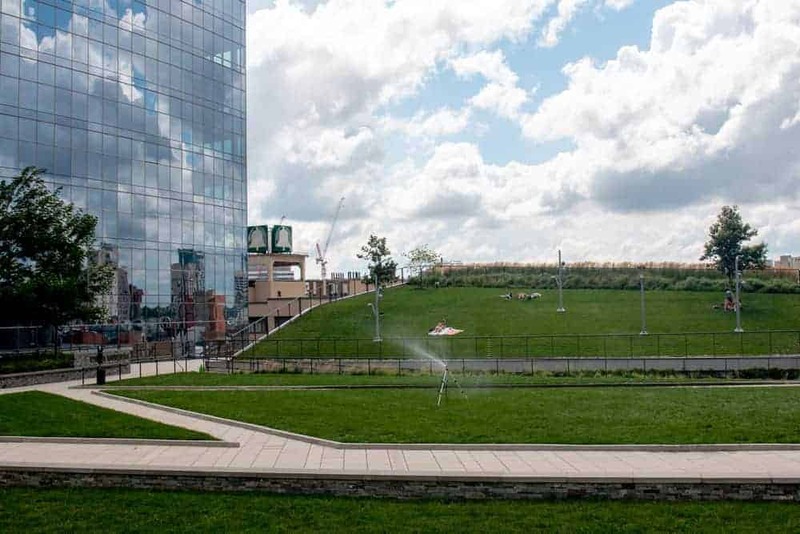 In the past, Cira Green has also featured various events including a pop-up beer garden and live music. I can’t imagine many better places for a beer garden in Philadelphia, so I hope they continue this more frequently in the future. Cira Green is a great spot to relax in the city. 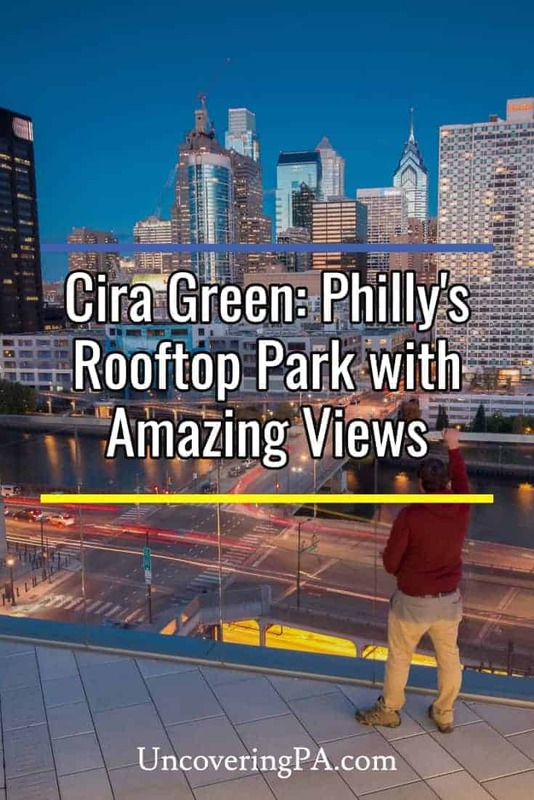 If you are looking for a great view of Philly’s skyline or just want to check out a unique park, make sure you don’t miss Cira Green on your next visit to the city. 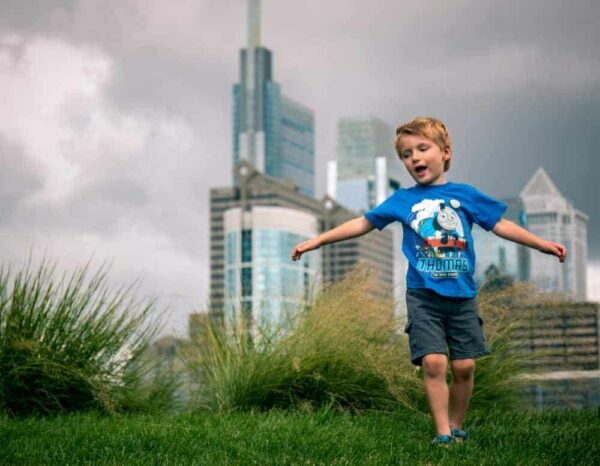 Cira Green is a fun place to enjoy the city. 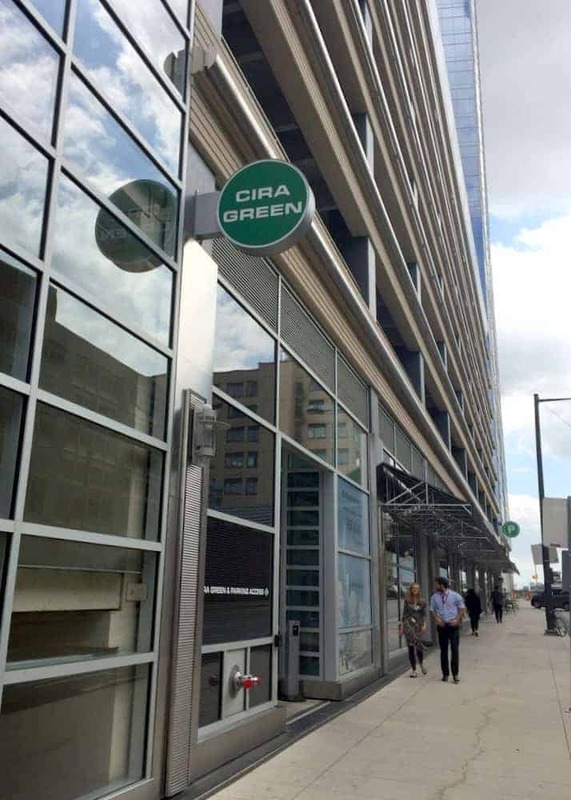 The main entrance to Cira Green is located on South 30th Street between Chestnut and Walnut Streets, on the western banks of the Schuylkill River in Philadelphia. There is a small circular sign that marks the entrance at the following coordinates: 39.952897, -75.183766. After walking into the garage, take the elevator to the 11th floor. From here, follow the green pathway up the nearby ramp to the roof of the garage. The main entrance to Cira Green on South 30th Street. It’s worth noting that visitors are only allowed on this path and on the rooftop. I was once asked to leave while taking photos from the level just below Cira Green when it was raining, despite no parked cars being nearby. There is also another elevator that takes you directly onto Cira Green. This elevator can be accessed from the southern side of the garage off of the main road. Cira Green is open from 7am to 8pm for much of the year, but hours expand to 6am to 10pm during the summer months (which is not defined by the park’s website). When you get off the elevator on the 11th floor, follow this path up towards Cira Green. One thing worth noting is that the park seems to close even during light rain, so keep that in mind when planning your visit. Also, security is present in the garage and seems fairly quick to respond if you have any issues or are visiting when you shouldn’t be. 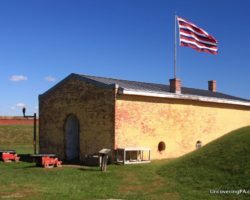 More information on visiting Cira Green can be found on the park’s website. 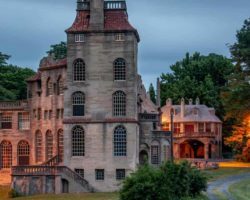 Looking for more great outdoor spots in Philly? 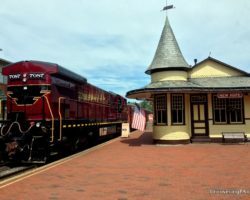 Check out the John Heinz National Wildlife Refuge, Wissahickon Gorge, and Bartram’s Garden. 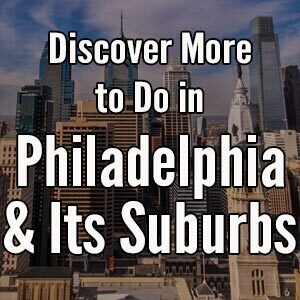 There are also a ton of great free things to do in Philadelphia.